**D&B RECOMMENDS USING GUARD RAILS ON ALL PROJECTS AND TYING OFF WHENEVER POSSIBLE- GUARD RAILS SHOULD BE USED WITH SCAFFOLDING WHEN YOU ARE STANDING 10' OR HIGHER - WHEN USING SCAFFOLDING YOU SHOULD NOT STAND HIGHER THAN 4 TIMES THE SMALLEST BASE DIMENSION. SO IF YOU ARE RENTING THE NARROW SCAFFOLDING THAT IS 28" WIDE THE HIGHEST YOU SHOULD STAND IS 9' UNLESS YOU ARE TIED OFF TO THE STRUCTURE. YOU CAN ADD OUT RIGGERS TO INCREASE YOUR BASE AND MAKE THE SCAFFOLDING SAFER. IF YOU WORKING ON A WALL YOU CAN USE A 30" OUTRIGGER. THIS WILL MAKE YOU BASE 58" AND YOU CAN SAFELY STAND AT 19'. 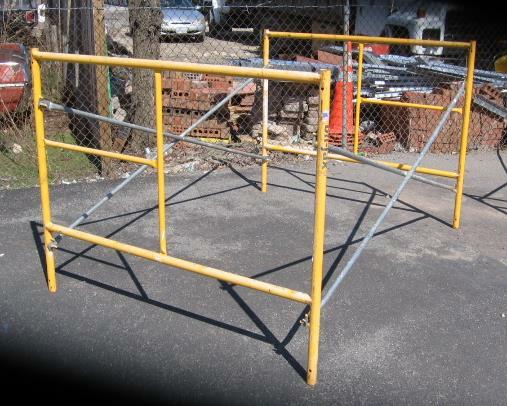 * Please call us for any questions on our scaffold 3 foot tall 5 foot wide rentals in Sterling VA, Herndon VA, Leesburg VA, Reston VA, Chantilly VA, McLean VA and Greater Arlington VA, Alexandria VA and Bethesda MD.